An e-newsletter from the Institute's National Center on Educational Outcomes (NCEO) highlighting its recent publications and new and ongoing research findings. 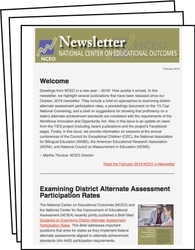 Past issues are listed under "Archives" on the NCEO Newsletter page at http://nceotacenter.org/newsletter. The October issue of NCEO's e-newsletter highlights new publications, new center funding, and upcoming activities. The June issue of NCEO's e-newsletter highlights recent webinars, products, and upcoming activities.